It was September 1941 when Sergeant Leroy Adams of the 152d Field Artillery Regiment pushed his section of 75mm guns up to knock out six enemy tanks that were threatening a nearby infantry company. It was his first time bringing artillery to the direct support of infantry. He did so, however, by use of blank fire, and the hits scored on the enemy tanks were done so with the use of flags held by umpires. Although much of the rest of the world was at war, the United States was still at peace. Nevertheless, senior Army leaders like Army Chief of Staff General George C. Marshall realized that war was a serious prospect, and they launched what was to become the largest combined arms exercise in the history of the United States: the Louisiana Maneuvers. This event was meant to test the readiness of both active component forces and those of the National Guard and Organized Reserve. National Guard divisions from across the United States were mobilized for a period of one year for this exercise. One such division was the 43d Infantry Division. Headquartered in Connecticut, the division was made up of units from Maine, Vermont, Connecticut, and Rhode Island. The 103d Infantry Regiment and 152d Field Artillery Regiment, both of the Maine National Guard, assembled in the cities of Portland and Bangor on 24 February 1941 for the long trip down to Camp Blanding, Florida. The two units could not have conceived how long and how far this association would take them. The 103d Infantry Regiment was one of the largest units in the Maine National Guard at the time. It claimed the lineage of the 2d Maine Volunteer Infantry, which compiled an impressive record through the first two years of the Civil War, serving in the Bull Run, Peninsula, Antietam, and Fredericksburg campaigns. In 1863, the regiment’s enlistments ran out, and the majority of the unit’s personnel were transferred to the 20th Maine Volunteer Infantry Regiment, where they would serve through the Gettysburg (where they defended a key position on Little Round Top), The Wilderness, Spotsylvania Court House, Cold Harbor, Petersburg, and Appomattox campaigns. It was activated as the 2d Maine Infantry Regiment in 1916 for service on the U.S.-Mexican border. When it was called up for World War I, the 2d Maine was reorganized and designated the 103d Infantry Regiment. The 103d sailed to France in 1917 as part of the 26th “Yankee” Division and fought in the Champagne-Marne, Aisne-Marne, St. Mihiel, and the Meuse-Argonne campaigns. In 1922, it was consolidated with the 3d Maine Infantry Regiment, given the permanent designation of the 103d Infantry, and assigned to the 43d Division. Compared to the 103d, the 152d Field Artillery Regiment was a relatively new formation. Organized in northern Maine in 1921, the regiment received its federal recognition in 1922 at Houlton, Maine. The regiment added a second battalion in 1929, with new batteries in Bangor and Brewer. In 1933, the regiment transitioned from horse-drawn artillery to motorized guns, although they still maintained their M1897 French 75s. Both units arrived at Camp Blanding in the middle of March 1941, to the disappointing discovery that the camp was little more than a tent city. The units’ activity picked up, as the Army’s plan for retraining National Guard divisions commenced. The units spent weeks training in basic soldier skills such as marching, physical fitness, and marksmanship. As time went on, their ranks swelled with replacements from across the United States as the Army attempted to bring the National Guard divisions up to full strength. The two Maine units then traveled to Louisiana to take part in large-scale maneuvers with Regular Army forces and reserve component units. Maneuvers soon began upon the 103d Infantry and 152d Field Artillery’s arrival, first at the company and regimental level, but later with divisions and corps. During one such maneuver, the 103d found itself bested by troops from the 31st “Dixie” Division, causing local papers to report, “Once again the rebel yell sounded through the Louisiana woods as the Southerners pushed back the Yankees from Maine.” The commander of the 103d, Colonel Spaulding Bisbee, counterattacked. He “dismounted his regiment and made a night march through the nearby woods and swamps, hitting the rebels in the rear, routing them and ‘capturing’ so many prisoners the 103d didn’t know what to do with them.” Reportedly, corps staff was in disbelief that any unit would be crazy enough to make a forced march in the middle of the night through woods and swamps. By 1 August, the 43d Division was en route to Dry Prong, Louisiana. It was there that Army staff had determined to test their new war machine. New Army doctrine concerning division force structure, use of armor, anti-tank warfare, combined arms operations, and air-to-ground support were all on the table to be reviewed. Marshall oversaw the planning while Major General Lesley J. McNair, as General Headquarters Chief of Staff, oversaw the exercises. Other famous names graced the maneuvers, such as Colonel Dwight D. Eisenhower, Major General George S. Patton, and Lieutenant Colonel Omar N. Bradley. These leaders were given a chance to showcase their planning and combat capabilities during the maneuvers. The war games encompassed a “battlefield” of 30,000 square miles, from Jasper, Texas, to the Mississippi River, with a force of 472,000 troops assembled for the maneuvers. For the Guardsmen, much of the maneuvers were senseless marches back and forth with little tactical value. Occasionally there were moments of clarity, such as when Sergeant Leroy Adams of the 152d was called on to provide direct fire support to an embattled infantry company. By the rules of the maneuvers, any infantry unit within one hundred yards of a hostile tank was considered neutralized. However, a .50 caliber machine gun was considered an anti-armor weapon. Thus, when Sergeant Adams brought up his gun section to act as an anti-tank unit, he had his trucks roll in first, firing their .50 caliber heavy machine guns steadily until the artillery could be set up. Notwithstanding the confusion and irregularities in the rules, the maneuvers were deemed by General Headquarters to be a resounding success. They exposed weaknesses and vulnerabilities that forced the Army to make tactical and technical changes prior to the war. The Louisiana Maneuvers concluded on 2 October 2 1941 and the 43d Division headed back to Camp Blanding. They would not remain there long, moving to additional maneuvers in the Carolinas from 28 October to 3 December. Emphasis was made in training on infantry-artillery cooperation and use of forward observers for ensuring accurate artillery fire. With the attack on Pearl Harbor on December 7, the 43d Division’s mission changed drastically as training for combat began. In addition, the Army implemented a massive reorganization among its divisions. The 43d had been what was called a “square” division comprised of four infantry regiments with two brigade headquarters. It was reorganized into a “triangular” division of three regiments; the two brigade headquarters were inactivated. This reorganization befell the 43d when it arrived in Camp Shelby, Mississippi on 14 February 1942. The division now became the 43d Infantry Division. For the 152d Field Artillery, the change was more dramatic. The revision did away with field artillery regiments, replacing them with battalions as the basic organizational formation. On 19 February, the regimental headquarters battery was designated the 203d Field Artillery Group and removed from the division. 1st Battalion, 152d Field Artillery, was re-designated the 203d Field Artillery Battalion and relieved from the 43d. Both of these units would see significant combat action in the European Theater of Operations. 2d Battalion was re-designated the 152d Field Artillery Battalion and paired with the 103d Infantry to form the 103d Regimental Combat Team (RCT). The 103d RCT began their movement towards the Pacific Theater of Operations (PTO) on 3 September 1942. The first stop was Fort Ord, California, where they received new equipment (105mm howitzers for the 152d) and conducted additional training before boarding troop ships on 1 October, bound for New Zealand. It was a relief to all when the convoy arrived in Auckland on 22 October. As the 103d RCT offloaded, a band of New Zealanders played the “Maine Stein Song,” the unofficial march of the 103d. The newly arrived U.S. soldiers then settled in at Mangere Crossing, south of the city, building a tent city for their three week stay in New Zealand. The 103d RCT embarked for the island of New Caledonia during the first week of November. This would be their home until February 1943 and was the “jumping off” point for their participation in the PTO. As the New Year dawned, the 103d RCT underwent amphibious landing training. On 11 February, the 152d was transported to Guadalcanal in the Solomon Islands. The 103d followed two days later. 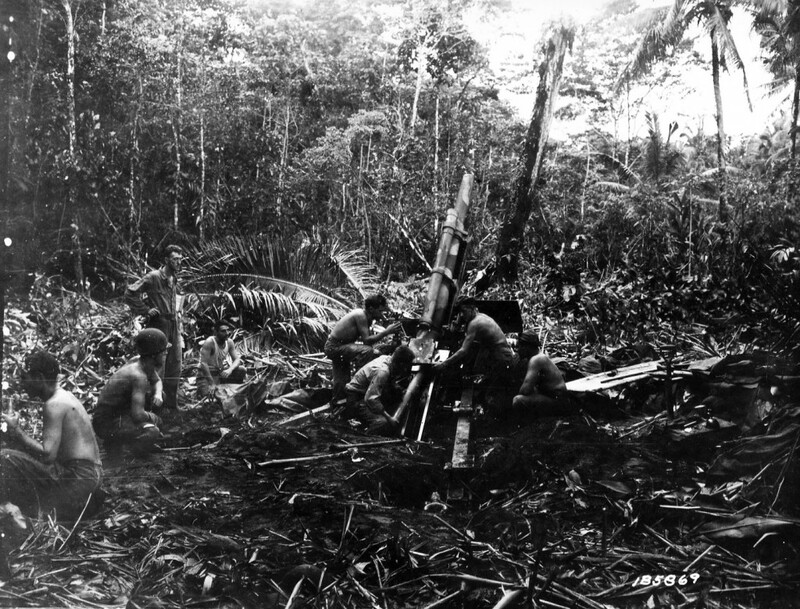 On Guadalcanal, the soldiers of the 103d RCT saw firsthand the destruction of war: wrecked vehicles, shredded trees, and shell-pocked beaches. They listened to the stories from the Marines who had gone through heavy combat to take the island. Shortly after they arrived, the men of the 103d tasted war for the first time as Japanese bombers struck on 17 February, waking men from their sleep in a panic. Guadalcanal had been seized to open up the rest of the Solomons to U.S. forces. The next target was to be the island of New Georgia, and Allied leaders selected the 43d as the division for the job. Before assaulting New Georgia, the 103d first had to gain a foothold on the nearby island of Banika to give the U.S. forces a staging area. That island, as well as the adjacent Pavavu, would be built up as supply staging points and air bases. The 103d Infantry landed two battalions on Banika on 21 February, seizing the island with no difficulty as the Japanese had abandoned it days earlier. Work immediately began on the construction of an airfield. The Japanese had their own fighter base on Munda, New Georgia, from which they flew harassing flights against the U.S. invaders as well as interdiction flights against U.S. aircraft. The airfield at Munda was the main objective for the 43d Division. To get there, the following waypoints were laid out: Rendova Island, Viru Harbor, Segi Point, and Wickham Anchorage. Rendova was to be the command and control point for the division headquarters. 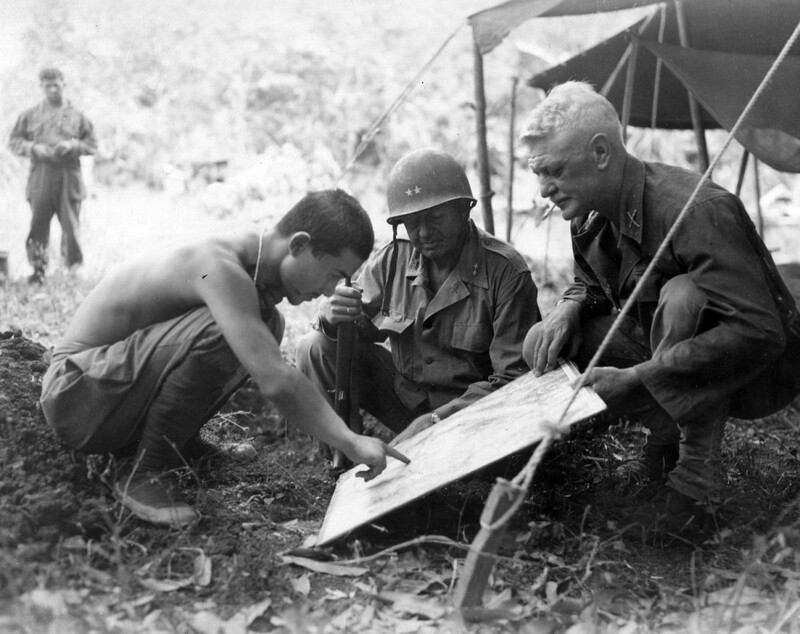 Prior to the invasion of Rendova, a strong reconnaissance party of staff officers and artillery observers led by native guides infiltrated the island, slipping past Japanese defenders. They planned and mapped enemy positions, suitable landing areas, and possible firing points for artillery. The 103d was split into its three battalions for this operation. 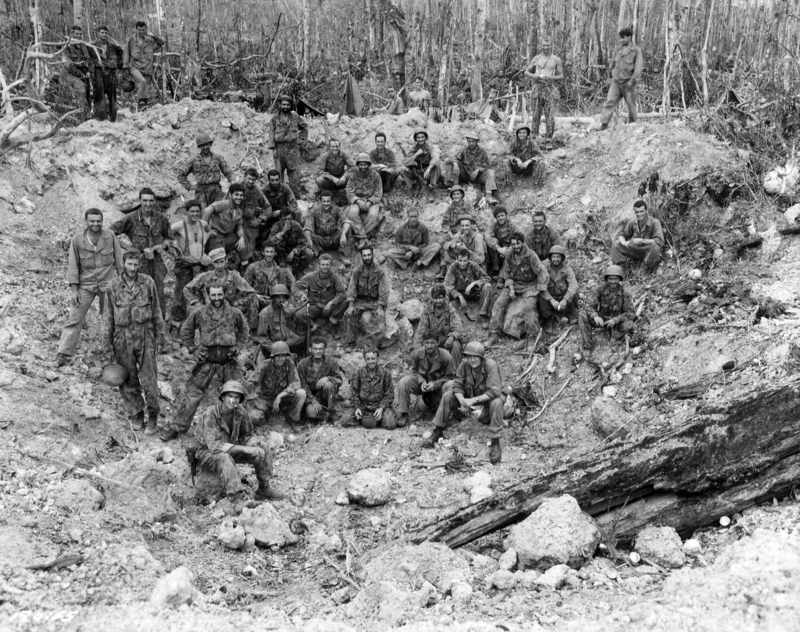 Companies A and D, with elements of the 4th Marine Raider Battalion, seized the as-yet unoccupied Segi Point on 22 June, in an unplanned offensive to prevent the Japanese from reinforcing the island. The rest of the regiment began its operations on 30 June, with the rest of 1st Battalion (1-103 INF) landing at Segi Point, 2d Battalion (2-103 INF) striking Wickham Anchorage, and 3d Battalion (3-103 INF) moving to Rendova to act as division reserve. The position at Segi was quickly consolidated, with Battery A, 152d Field Artillery Battalion (A-152d FAB), landing and setting up fire support positions. Battery B, 152d Field Artillery Battalion (B-152 FAB) accompanied 2-103 INF Infantry to Wickham, setting up firing positions in the thick island mud that the Wickham position was rapidly turning into. Battery C, 152d Field Artillery Battalion (C-152 FAB) would land on Rendova on 2 July to provide fire support from the island. Offensive movements began at all points on New Georgia. The infantry began to maneuver inland, hampered by bad weather, dense jungle, and a heavily dug-in enemy. The Japanese had carefully selected their primary, secondary, and tertiary defensive positions, concealing their pillboxes in natural-looking emplacements. These defensive positions provided overlapping fields of fire for rifles and machine guns, making U.S. infantry assaults a bloody endeavor. Like the rest of the division artillery, the 152d began extensive fire missions, with limited results due to Japanese movements. When U.S. artillery began to rain down on them, the Japanese would move their troops close to the American lines, and when U.S. artillery would begin protective fires, the Japanese would fire 90mm mortars to make U.S. soldiers think their own artillery was firing short. This degraded the infantry’s trust in their own artillery at a time when they needed it the most. Continued operations would restore this trust. After occupying Segi Point and relieving the Marines at Viru Harbor, 1-103 INF carried out defensive operations for the remainder of the operation. It took four days for 2-103 INF, Marines, and B-152d FAB to push out all the Japanese from Wickham. Company G ambushed enemy reinforcements attempting a nighttime landing, killing nearly eighty Japanese soldiers. The 103d consolidated its positions, established patrols, and continued mopping up the enemy. The 169th and 172d Infantry Regiments were slogging through tough enemy resistance as they drove overland for Munda Point. The fighting resembled a World War I battle, with advances prefaced with artillery barrages and progress measured in yards. 3-103 INF was brought up on 14 July to reinforce the 169th and 172d Regiments and took part in the slow advance against Munda. By the 19 July, the troops from the 103d were leading the attack due to heavy casualties in the 172d Infantry. The same conditions, however, that had broken the 172d came to bear on 3-103 INF: heavy casualties from repeated attacks, incessant indirect fire, and harassing night attacks. Combat stress was taking a severe toll on the front-line units. To break through the Japanese resistance, 2-103 INF was landed next to 3-103 INF on 22 July. From 25-29 July, the 103d made repeated attacks against the Japanese lines, gaining only yards and taking heavy losses. The Japanese were not merely passive observers; they mounted a counterattack on 25 July and caught the division command post relatively undefended. Captain Harold Slager of the 152d caught wind of the advance and shadowed the enemy, radioing back reports until he was killed by enemy machine gun fire. 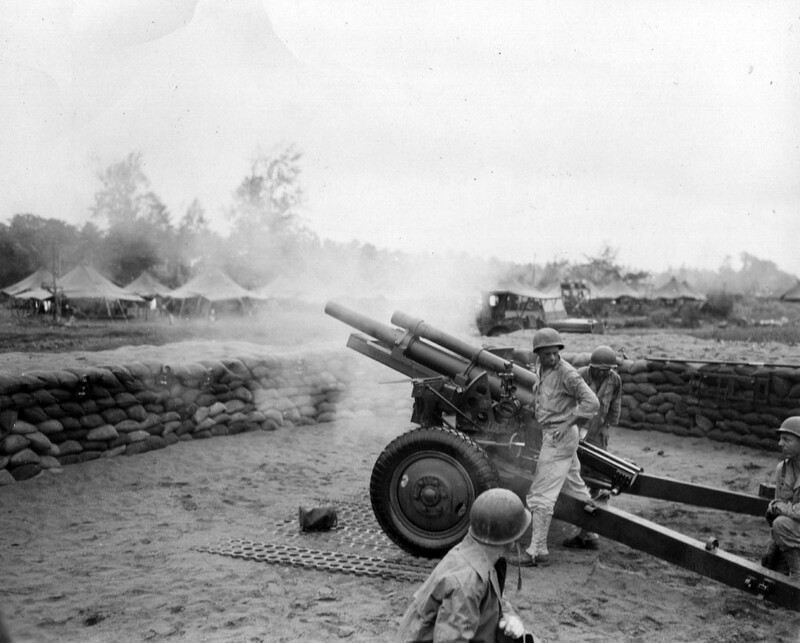 As the Japanese closed on the command post, divisional artillery opened with close protective fires called in by forward observers from the command post, including the division artillery commander. This barrage continued all night to prevent enemy approach and proved successful in keeping the command post safe until reinforcements could be landed. The 152d FAB took part in these fires, but their priority was direct support of the 103d as it fought pillbox-to-pillbox on Munda. The RCT was learning quickly to adapt. The 103d would pull back from its lines into a smokescreen provided by the 152d, and then the artillery would register fires on the Japanese position. The Japanese would then move forward to the 103s’d former lines, thinking they were still there, at which time the 152d would fire for effect on the regiment’s former position. It was adaptations such as this, as well as direct fires on enemy pillboxes, that allowed for a breakthrough on 1 August. Munda Airfield was in U.S. hands by 5 August. The month-long campaign had been brutal to both sides. During the fighting on New Georgia, the 43d Division experienced a higher number of “war neurosis” (what would be now termed post traumatic stress) cases than almost any other division in the war. The never-ending attacks to gain yards, the nighttime harassment, and the heavy casualties had sapped the infantry’s morale to the breaking point. Reports from the few captured Japanese indicated a similar situation: continued and random U.S. artillery fire had shattered the nerves of defenders. Soldiers from both sides suffered from the excessive heat and rain, disease, insect bites, and the fear of the unknown presented by the jungle. On 8 August, the 103d RCT took a defensive position in reserve on New Georgia and the Russell Islands for a badly needed rest. They remained in place until 17 February 1944, when they rotated back to New Zealand for additional jungle training and to incorporate replacements. In June, the 43d Division was transferred to the Southwest Pacific Command in order to begin the New Guinea Campaign. 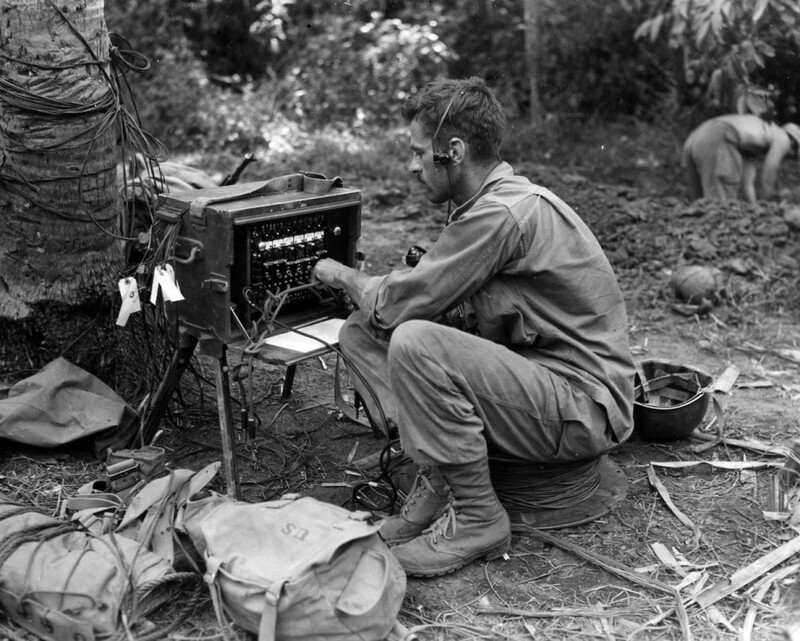 The 103d RCT landed on the island of Aitape in New Guinea on 22 July to contain a desperate enemy counter-attack. However, this counter-attack did not strike the 103d, and their participation in this campaign consisted of continuous patrols and skirmishes in defensive positions. The 152d FAB was briefly detached in support of two other units where it gained experience in patrolling, learned the importance of using smoke to mark targets, and tested new radio equipment. The 152d also experimented with the use of Piper Cub observation planes, a practice that was retained for the Luzon campaign. General Douglas MacArthur had promised a return to the Philippines, and he made good on his promise early in October 1944 when Sixth Army landed on Leyte Island. On 9 January, a vast armada assembled in Lingayen Gulf off the island of Luzon, the largest island in the Philippines. U.S. naval gunfire and air attacks pummeled the beachhead for hours prior to the landing. The 103d RCT was to move quickly inland, seizing the towns of San Fabian, San Jacinto, and Manaog before reaching their final objective, Hill 200. Hill 200 was a high point approximately ten miles inland that dominated the surrounding area. The terrain was not like the jungle of New Georgia, but was made up of rice paddies and undulating ridges. The 103d Infantry went ashore at 0700, with the 152d following at 1300 to set up firing positions on the beach. The landing was unopposed and the regiment moved inland by column of battalions, with 3d in the lead, followed by 2d, and 1st in support. As the day went on, Japanese resistance began to increase. Using 75mm guns, the Japanese would initiate long-range ambushes on the 103d, retreating when approached by riflemen. This delaying tactic did not inflict many casualties, but it did slow the regiment’s advance. The next day saw the 103d making good time but it was still slowed by harassing enemy attacks. Riflemen, acting in conjunction with artillery fire, steadily advanced and destroyed several of the Japanese guns. Everything changed on the morning of 11 January, when 2-103 INF began the assault on Hill 200. It was a heavily fortified position, with caves, tunnels, and trenches dug into the hillside for both infantry and artillery. It took five days of brutal fighting to take the hill, characterized by heavy supporting fire from the 152d FAB, the 105mm howitzers in the 103d’s Cannon Company, and the 103d’s organic mortars. The rest of the battalion worked on securing the perimeters around the hill with aggressive patrolling, which sparked intense fighting. By 16 January, Hill 200 and its environs were in U.S. hands. An enemy armored counterattack in the vicinity of barrio Potpot resulted in a long night for the men of 3-103d INF, as they fought off the attack and destroyed eleven Japanese tanks. On 17 January, the 103d RCT set off against its next objective, Hill 600. Similar in toughness to Hill 200, Hill 600 would bleed the 103d considerably over the next few days. On 21 January, Japanese artillery struck a forward command post during a meeting of 3-103 INF’s officers, killing or wounding all the battalion’s company commanders. 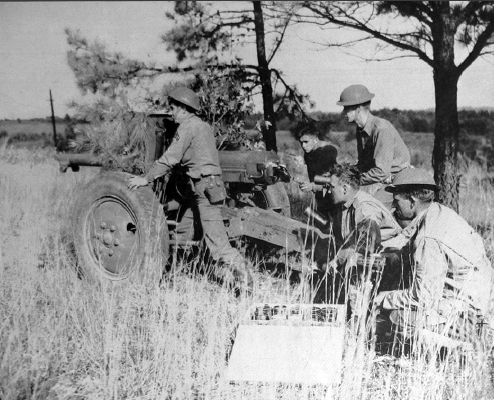 The 152d FAB was providing direct support to the infantry, while taking counter-battery fire as well as ongoing attempts by Japanese infiltration teams to sabotage its guns. As pronounced by division commander, Major General Leonard F. Wing, the battalion distinguished itself by never slacking in fire support while conducting aggressive patrolling to interdict enemy teams. The 152d alone killed fifty-four enemy personnel with small arms fire during their patrols during this phase. The struggle for Hill 600 continued, bringing in various other 43d Division units and ranging over onto Hills 700 and 800. Fighting continued for days, with both sides denying the other the summit of Hill 600 but neither had sufficient strength to occupy it. Both sides’ artillery pounded the infantry mercilessly. By the end of the month, the lines had stabilized into a stalemate of sorts, as U.S. troops began patrols to root out outlying Japanese positions and find targets for the artillery. On 15 February, the 103d came off the front lines after thirty-eight days of consecutive combat, having taken 724 casualties. The 152d FAB had expended 27,223 rounds of high explosive shells during this same period. The 103d RCT remained in reserve to rest and refit until 9 March, when it moved to Wac Wac Country Club, on the outskirts of Manila, to reinforce the 1st Cavalry Division. They then began an offensive against a portion of the Shimbu Line, a series of defended hills and ridges outside Manila. By 17 March, the 103d had taken advantage of weak points in the line, overrunning three enemy ridge systems, and holding sixteen square miles of enemy territory. Now that they had denied the enemy an approach to Manila, the 103d RCT continued its forward movement, neutralizing enemy positions. On 21 March, they captured the 1,200 foot Mount Tanauan, breaking the Japanese line and sending the survivors in headlong retreat. During this operation, the infantrymen of the 103d had to scale the cliffs of the mountain and fight cave-to-cave with the Japanese. With infantry and artillery working in very close cooperation, the 103d RCT had outflanked the Japanese position by 29 March, taking forty-four square miles and killing 798 of the enemy, with losses of only thirty-three killed. The 103d RCT was pulled off the line on 1 April and moved to the Laguna de Bay region east of Manila, where it was to establish a blocking position to divide the enemy forces still on Luzon. The move was conducted under cover of darkness and as silently as possible. Motorized transports moved the infantry and artillery into their positions in the mountain pass of San Miguel. On 4 April, the 103d Infantry attacked and completely surprised the enemy to their front, taking the entire San Miguel Valley by noon. The last remaining road that the enemy could use to regroup had been secured by 6 April. From this time until the end of the month, the 103d occupied various positions in the region, conducting patrols and disrupting enemy plans for a counter-attack around the New Bosoposo region. The 152d FAB’s use of reconnaissance by fire helped break up enemy formations trying to converge for an attack. Following their successes against the Shimbu Line, the 103d RCT was moved to secure the Ipo Dam, outside Manila, in order to maintain the city’s critical water supply. Manila was on the verge of a health crisis from lack of water because of recent and brutal battle to capture the city. The seizure of the Ipo Dam would restore thirty percent of the city’s water. The 103d Infantry set off in another night attack on 6 May, meeting such little resistance that they blitzed straight forward through the difficult terrain without halting until 11 May. They were only two miles from the dam and, unbeknownst to them, were in a race with a regiment of friendly Filipino guerillas to reach it first. The 103d seized two hills over the next two days, digging in at night, and repulsing a suicidal attack by the Japanese defenders on 14 May. The 152d FAB followed close behind, over roads bulldozed from division engineers. During this fast advance, most enemy artillery positions were not within direct line of sight to the infantry on the ground, so the 152d’s observation planes were the only practical way to spot targets. The artillerymen found that using high-angle fire in the rocky terrain was especially effective. The 103d reached the dam on 17 May, as did the guerillas, sparking a debate over who was first to the dam that would last for years after the war. Regardless, the 103d RCT had seized the Ipo Dam intact, accomplishing their mission. The American and Filipino advance came so quickly that despite preparing the dam for demolition, the Japanese did not have time to detonate the explosive charges they had set to destroy it. Acting in concert, the 103d Infantry and the 152d FAB made a formidable pair. After the brutal blooding they experienced on New Georgia, both units learned the important of fire and maneuver, as evidenced by their performance in the later campaign on Luzon. Elements of the 152d operated close in on the infantry’s position, usually only a mile or so behind the front lines. Forward observers from the artillery accompanied each infantry battalion in every operation, and liaison officers from the artillery served in the infantry battalions’ staff. Infantry officers learned from their forward observers and began adjusting fires themselves. The 103d RCT also learned how important cooperation on all levels could be. The 152d advised the Cannon Company, 103d Infantry, on techniques and procedures for gunnery. This resulted in the Cannon Company participating in over two hundred fire missions with the 152d. In return, artillerymen learned patrolling techniques from the infantry. The effectiveness of this 152d’s training resulted in several hundred enemy soldiers killed or captured during patrols conducted by the artillerymen. The 103d RCT moved back to the rear in June, to rest and refit in preparation for the invasion of Japan. The 43d Infantry Division was to establish a beachhead on Ariake Wan and seize the airfields for U.S. use. Fortunately, it was not to be. Rumors of the impending Japanese surrender swept through the 103d RCT’s camps on 7 August, the day after an atomic bomb devastated the Japanese city of Hiroshima. The news of the surrender of Japan on 15 August was followed quickly by orders for the occupation of Japan. The 103d RCT was assigned to the occupation forces, arriving in Japan on 13 September. They were posted in the vicinity of Tokyo and had only just settled down into their role as occupiers when they received the long-awaited orders to return home. On 29 September, the 103d RCT boarded troop ships for San Francisco, arriving on 9 October 1945. From there, the units were inactivated and the men returned home. This was not the end of the story for either unit. In fact, they continued their association as the 103d RCT of the Maine Army National Guard when they got home. Both were destined to see significant changes to their organizations, with the artillery becoming an anti-aircraft battalion and the infantry transferring to an armored role, both reflecting the changing tactical situation. Both units were fated to have their lineage and honors carried on by one unit, the 133d Engineer Battalion, which continues to the present day.